Deck maintenance is the key to prolonging a deck’s structural integrity and overall appearance. It is well known that a wooden deck has to be cleaned and sealed every couple of years to deflect the major causes of water and UV damage that would otherwise occur. Board warping, cracking, splitting, UV fading, discoloring, and mold infiltration are just some of the major damaging effects that unprotected wood is subjected to. Before now you could only purchase a wood cleaner to clean common dirt, grime, and mold from a deck surface. You would then have to purchase separately a wood brightener to level the pH of the wood and open the wood pores to prepare them for a coat of deck stain. Because of this hassle, many people would simply skip the all-important brightening step, which unknowingly, would cause the deck stain to fail prematurely. A lack of proper deck prepping is the number one reason a deck stain or sealer fails prematurely. The wood professionals, to get the most performance from a deck stain use this 2-step restoration method. Doing an online search for Restore-A-Deck products near me will bring up one of the most innovative products for deck maintenance. RAD as it is called, contains both Step 1 Wood Cleaner and Step 2 Wood Brightener packaged in a convenient and easy to use kit. The simple instructions of mixing the concentrated powder is safe yet extremely effective in removing dirt, grime, mold, and graying from any deck or exterior wood surface followed by the wood brightener prior to staining or sealing. Searching Restore-A-Deck products near me will give you the best buying options online, as RAD is not readily available in most local hardware stores. Wood professionals developed this unique one of a kind, 2-step wood restoration kit. Its effectiveness for prepping wood prior to staining is outstanding and can give deck owners the professional like results they have always wanted without the cost. Through searching Restore-A-Deck products near me, it is revealed that the total average cost of prepping a deck using the RAD kit is around .07 cents per square foot. That is incredibly affordable considering the amazing results this product is capable of. We live in Normal, IL. Is RAD sold here? No dealers there. Shipping only takes a couple of days. Do you sell RAD products in the Madison, IN 47250 area? No, there are not any dealers there. shipping only takes 2-3 business days and RAD products ship free. I have just cleaned my deck with Thompson deck cleaner. Can I apply RAD on the cleaned deck without using the RAD cleaner? It would be best to use both the RAD Cleaner and the RAD Brightener kit so the wood is properly balanced. How long does it take to ship to Eugene Oregon? Do you sell in stores in San Francisco Bay area? We do not. Shipping takes about 4-5 business days. My deck was just sanded and pressure washed but the stain won't be arriving for a few days so it'll be a week between pressure wash and application. Would you recommend washing the deck before applying the stain? No. If you sanded the deck with 80 or grit finer paper, just apply one coat of the RAD stain. We do not have dealers there. Shipping takes 3-4 days to arrive. There are not. Shipping takes 2-3 business days. We do not. shipping to Ohio only takes 1-2 business days. Hi I’m chicago id like to have by this Friday. Is that possible? If you place a phone order on Thursday it should arrive Friday or Saturday. Typically only takes 1 day to Chicago. You guys are notoriously the best product for cleaning decks, why aren’t you in stores? We are working are way into stores as we speak. About 20 so far. Is restore a deck sold in Illinois- specifically Chicagoland ? It is only currently shipped from our site to you. Takes 1-2 days. How long does it take to get to Canada? Depends on where in Canada? Available in Ontario , Canada ? Sorry but no. We ship to Canada though. They are not. Please order online. No, but we ship to Iowa from our website. They are not. We ship there from our website. Are restore a deck products eligible for shipment to Anchorage, Alaska? 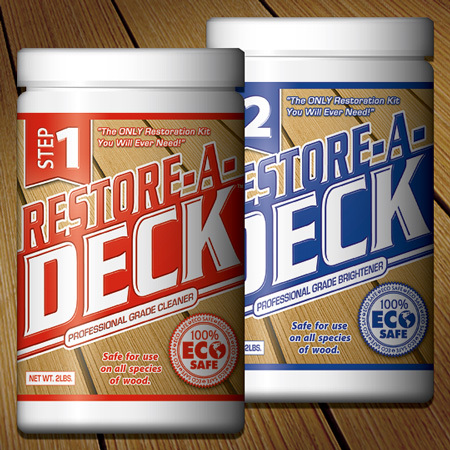 IS RESTORE-A-DECK SOLD IN KANSAS CITY, MISSOURI? No it is not at this time. Shipping to MO only takes a few days. Are Restore a Deck products sold in the Birmingham, Al market? Online only for your area. Shipping takes about 2-3 days to AL. Online only for your area. Shipping takes about 3-4 days to Texas. Port Haywood, Virginia. Near Williamsburg. There are not any dealers in VA. Shipping takes about 2-3 days. Just wondering if your products are sold in the Grand Rapids MI area? They are not but we can ship to you from our Metro Detroit Warehouse.